As an aid to research on the Haplogroup I1 THOMPSONs, I've compiled tables of all the test subjects I could find who were Haplogroup I1 and surnamed THOMPSON, THOMSON, THOMPSEN, or THOMSEN. I've grouped matching individuals and given as much lineage information as was supplied or that I could uncover. I would like to encourage anyone to please not hesitate to contact me if you can add to the table, especially to improve the lineages, correct any errors I've made, or alert me when a newly tested individual needs to be added to the table. And I strongly recommend those interested in the genealogy or DNA testing of Haplogroup I1 THOMPSONs to join the THOMPSON-DNA Mailing List where we can discuss these topics. A study of these tables makes it clear that 12 and 25 markers — and even 37 markers — are simply not enough to determine with confidence whether individuals are closely related or not. I urge everyone to upgrade to at least 37 (preferably 67 or 111) markers. This upgrade is especially needed for those whose haplotype is modal or near modal. Also, if there are those in your "group" who have been tested elsewhere (e.g., at SMGF, the Sorenson Molecular Genealogy Foundation) I recommend upgrading to 111 markers, so you can pick up all the markers tested by them and be fully comparable with them. Other labs test a different suite of markers than FTDNA. While most marker values are directly comparable, some require a conversion factor to be applied. The four values usually needing conversion have their cell in the header row of the table darkened. Unfortunately, I've no way of knowing whether these factors were applied correctly, if at all, in the table at ThompsonFamilies.org, unless these individuals contact me and share their results as originally supplied by the testing companies. SMGF has an excellent table giving conversion factors. Note that those factors are to convert values to SMGF values, so do the reverse if you are converting from SMGF results. There was a time when having someone Haplogroup I1 deep SNP tested was pointless due to the lack of useful subclades — in other words, most known downstream SNPs were "private" (i.e.., known only to occur in only a single person). This is no longer the case. While the root clade, I1* (I-M253*), remains the most common one, other subclades now have significant membership, specifically, I1d (L22+) and I1d1 (P109+), so I now recommend all I1's be deep SNP tested. The FTDNA and ISOGG Y-DNA haplotrees once differed substantially, but are gradually reaching total agreement. Image released to the public domain by Hxseek at Wikipedia. 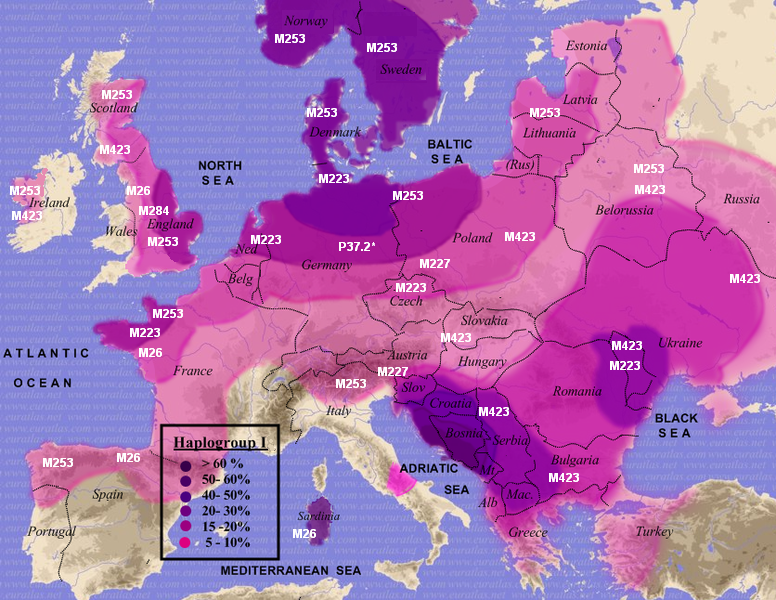 Labels in white are the SNP mutations; percentages are the frequency of Haplogroup I in the population. SNPs that appear on the map, but not in the chart at the left, are Haplogroup I2 SNPs. Hopefully, the map will be updated to include L22 and P109, which have their main concentration in southern Scandinavia and northwest Europe. The early lack of SNPs defining useful subclades of Haplogroup I led Ken Nordtvedt to create "clusters" based on STR test results (see his Excel spreadsheet for modals of these varieties [link died]). For a table showing modal haplotypes for Nordtvedt's Hg I clusters in FamilyTreeDNA marker order, please see my HTML transcription of Nordtvedt's spreadsheet. Among Nordtvedt's Hg I1 clusters, there are the ones he has grouped as, "AngloSaxon" (AS), and the others he has grouped as "Norse" (N) and "ultraNorse" (uN). The AS clusters are the most common, and these correspond to being root I1* (i.e., M-253+, but L22- and P109-). The N and uN clusters are a mix of I1d and I1d1. DYS455 = 8 is exclusive to and universal in I1, which makes it essentially as useful as SNP testing for proving Haplogroup I1. YCAIIa,b = 19,21 is universal in, though not exclusive to, Haplogroup I1. The most consistent differences between the AS and N/uN clusters are in two markers: DYS511 and DYS462. In AS, these are usually 9,12; and in N/uN these are usually 10,13 — though there are exceptions. In the table below, I've highlighted the table cells for the AS values in kelly green and for the N/uN values in royal blue. Because the AS clusters are far more common than the N/uN clusters, the Hg I1-AS modal haplotype is also the modal haplotype for all of Hg I1. To pick up Marker DYS511, you need to test the 38-67 FTDNA Marker panel, and to pick up Marker DYS462, you have to either test at SMGF (or Ancestry or DNA-Heritage, etc.) or take the FTDNA 67-111 marker upgrade. I would encourage all Haplogroup I1's to test these markers. For decades, my GGG-grandfather, Thomas THOMPSON (1797-1872), has been a genealogical brick wall for his descendants. It is my hope that Y-DNA testing will at least tell in which THOMPSON family we belong. After years of searching, we found a patrilineal descendant of Thomas who consented to being Y-DNA tested. We do not yet have a match, but surely we will eventually. We have determined that his line is Haplogroup I1, which is at least consistent with an old newspaper clipping stating that Thomas's father, Peter THOMPSON, was a Dane. 1. Genealogy and DNA test results of my THOMPSON cousin, Kit #122567 (Group I, below). 2. The THOMPSON DNA Project based at FamilyTreeDNA (as of 29 Apr 2011). 3. The DNA Results page at WFN, which is the origin of the "T" and "S" numbers (their page last updated 4 Sep 2007, with apparently no intention to upgrade further). 4. The Ysearch database (as of 22 Sep 2008). Some individuals occur in more than one database, and I believe I have managed to tell which ones are the same individual. Where I couldn't tell, the admin of the THOMPSON project kindly supplied the informaiton. So far, there are 63 THOMPSONs who are some form of Haplogroup I1. To view more of the page without scrolling, temporarily reduce the text size or page size in your browser. Red labels indicate markers that typically mutate more frequently than those labeled in black. There is no significance to the name of a group, for example, "BA" is not a subgroup of "B," it is simply where I inserted a new group in the table. 13 22 14 10 13 14 11 14 11 12 11 28 15 8 9 8 11 23 16 20 28 12 14 15 16 10 10 19 21 14 14 16 20 35 37 12 10 11 8 15 15 8 11 10 8 9 9 12 23 25 15 10 12 12 16 8 13 25 20 13 13 11 12 11 11 12 11 12 12 13 22 11 16 11 31 21 Haplogroup I1 modal values compiled by DGM from Nordvedt, SMGF, et al. is incorrect. Among other things, those THOMPSONs are Haplogroup R1b1. markers, to know whether he belongs in Group G or Group H, if either. I 122567 MCPYG 13 22 14 10 13 13 11 14 11 12 11 28 15 8 9 8 11 22 16 20 28 12 15 15 15 11 9 19 21 17 15 16 19 35 38 12 10 11 8 15 15 8 11 10 8 9 9 12 22 25 15 10 12 12 15 8 13 26 20 13 13 11 12 11 11 12 11 12 12 13 23 11 16 11 31 21 Pvt6, Vernon Eugene5, Milton Cicero4, John Alexander Campbell3, Thomas2, Peter1 THOMPSON (<1765-c1839) of Christian/Todd Co., KY Researcher seeks another descendant for testing; will subsidize. The positive results for P30 and M252 prove he is I1, not I2. The negative results for M21, M227, P259, L22, P109, and L211 rule out subclades I1a-I1e. FTDNA has not yet placed L338 on the Y-DNA haplotree; ISOGG calls it I1f. The Haplogroup I1 project has placed him in the AS1 (AngloSaxon-1) cluster. Unless there is some reason not apparent on the web page, in my opinion, moving him into the THOMPSON project is premature because his 12-marker haplotype is a perfect match for the modal haplotype of Haplogroup I1. Presumably, if we could see the Matches tab on his member page, he would have over a thousand 12/12 matches in the FTDNA database, possibly none of which are actually related to him in genealogical time. This individual needs to upgrade to at least 37 markers, preferably 67, to know if any of these matches hold up at a higher level. Checking the WARREN project results, I see he doesn't have a match there, but he may simply be the first WARREN in his family to be tested. In the interim, and in my opinion, it is misleading to viewers of the THOMPSON data table — and possibly to him, as well — to place him in any surname project other than the WARREN project, assuming that is his surname. His test results, alone, simply don't support him belonging to any surname project other than his own. 13 22 14 10 13 14 11 14 11 12 11 28 15 8 9 8 11 23 16 20 28 12 14 15 16 10 10 19 21 14 14 16 20 35 37 12 10 11 8 15 15 8 11 10 8 9 10 12 23 25 15 10 12 12 16 8 13 25 20 13 13 11 12 11 11 12 11 12 13 13 22 11 16 11 31 21 Haplogroup I1 N/uN modal values compiled by DGM from Nordvedt, SMGF, et al. While most of the above have not been deep SNP tested, their haplotypes indicate they would all be Haplogroup I1d (L22+) if they were. #150572 in Group W has been deep SNP tested, with the result that he is I1d. #150572 in Group W may actually be a member of Group V. We need #N46384 to upgrade to 67 markers, to see if he is an "in-betweener" bringing these two groups together — or to find out whether he belongs in either Group V, Group W, or in a group by himself. Twelve markers is simply not enough to draw conclusions. #93187 in Group Y has a 66/67 match with the modal haplotype for the TIPTON family, so it appears he must have an NPE in his patrilineal line. The further back the NPE occurred, the more THOMPSONs will be affected, so this individual needs to test cousins, until he locates the generation in which the NPE occurred. My thanks to Robert TIPTON, co-admin of the TIPTON project, for bringing this match with the TIPTONs to my attention. While #93187 has not been deep SNP tested, a member of the TIPTON family has been, with the result that he is L22+, but P109- and P259-, indicating he is I1d. #148837 and #25369 have been deep SNP tested with the result that they are P109+, proving they are I1d1. There is no need for anyone else in the family to be deep SNP tested, as you would all presumably have the same result, but at least one of you should keep testing new SNPs as they are discovered. The individuals in this table probably share the same common ancestor, though we need everyone to upgrade to 67 markers to be certain, and those not tested at FTDNA are urged to join and take advantage of the greater test offerings there. #25369/U8E99 and J6FSZ share two mutations away from the family modal haplotype (moss green table cells) supporting that they have a near common ancestor downstream of the family's progenitor. #22493/XSKJ4, S-11, and SMGF share a mutation at DYS449 (pink table cells), supporting that they have a near common ancestor downstream of the family's progenitor. S-11 and SMGF, the uncle and nephew, share a mutation at DYS 456 (deep pink table cells), supporting that they have a near common ancestor downstream of #22493/XSKJ4.